Like many, my season is over. My tri season finished up at the end of July, and as you know, I just did the Columbus Half Marathon last weekend. I find myself in that limbo period between Fall and Spring training where I have no “A” race to keep me going. I feel somewhat relieved that my life isn’t revolving around a training schedule, but then again, I feel somewhat lost that my life isn’t revolving around a training schedule. So, what to do? Well it’s November, so why not train for the most ubiquitous late fall race? That’s right. It’s time we talked about the turkey trot! 1). Indulgences: I am not one to promote a gorge-fest after a workout, but that philosophy goes out the window on Thanksgiving. There is something that makes us feel guilt-free when loads of homemade desserts, sweet potato casserole, turkey, stuffing, the works, after having raced earlier in the day. Yum! 2). SWAG: Turkey trots typically hand out great SWAG in an effort to promote fun and exercise. I have received a pumpkin pie, bottle of wine and stocking cap. I know of one trot in Ohio that awards free turkeys to the male and female who are in first at mile one. 3). Family Bonding: What better activity to kick off the day with your family than a race? Most races don’t start until late morning, so there is even time to sleep in. This year, my husband and I will be joined by my in-laws. And yet another example, one of my former training partners always runs the local trot with his wife since this is one of the few times during the year their schedules match up,and they can run together. 4). Fashion Show: I don’t know why, but it seems like every turkey trot has tons of people dressed in costumes and crazy outfits. Maybe it’s the cold weather that brings out the crazy in some runners? No matter what it is, it’s almost always quite the show! 5). Speed Work: After training for several weeks for longer endurance races like our goal half and full marathons that took place earlier in the fall, a late November short race is the perfect way to wake up those fast-twitch fibers. The turkey trot may not be the next 5K PR, but why not re-introduce some short speed in the next four weeks and change it up? Throw in 30 seconds of strides at the end of easy runs, or workouts such as of 10* 1 minute hard (45 seconds rest). It will hurt, but a little change does wonders, and it will remind your body of how it feels to go fast. 6). Introductions: We probably know of at least one family member or friend who would like to check out our love of running, but perhaps he/she is intimidated? Turkey trots are a great way to be an ambassador of running and encourage a newbie especially since they are fairly laid back and fun. Plus, many races are walker-friendly, which is an even better way to introduce someone to a race environment. 7). Kid-Friendly: Many races are kid-friendly and even have kids’ fun runs/walks. This is a great way to be a positive role model for your kids, showing them that exercise can be fun and that exercise is a priority in your life, even on Thanksgiving Day. 8). Fresh Air: The smell of Thanksgiving food cooking in the kitchen is absolutely heavenly, but after a few days of working hard in the kitchen, it’s nice to get outside and get some fresh air. It’s great to then walk back into the house and smell those great foods after a hard effort of racing! 9). Great Scenery: Some race courses are along trails, pathways, or downtown areas that you may not run at frequently or at all. It’s always nice to run somewhere different and learn a new place or route. 10). Racing Unstressed: The turkey trot is usually not the “A” race for most people (myself included), but it does keep the race mojo going. Being in the race environment always gets the adrenaline pumping and adds to overall racing experience without the added stress of hitting a time goal. What do you love most about Turkey Trots? Are you planning to do one this year? 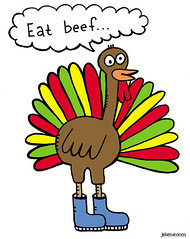 Would love to run a turkey trot, but alas, I will be working night shift the night before and night of Thanksgiving. Before I was a runner, the Turkey Trotters were an enigma to me. I always thought they must be super dedicated to run on a holiday. The tees are always hilarious to see throughout the rest of the year. Cartoonish turkeys on a tech tee are intrinsically awkward and always garner a grin out of me. I love Turkey Trots! I will be sad when I eventually start hosting Thanksgiving and they become logistically impossible. I have two different ones that I rotate doing, depending on which part of the family we’re visiting that year. Since this year’s will fall so soon after my marathon, I’m going to take it super duper easy. One thing to add to your list, they’re also a great source of conversation at the Thanksgiving table! I love the Cleveland Turkey Trot! It’s one of two races I’ve ran every year since I started running and one of the most fun every year!